The capaNCDT DTV capacitive displacement measurement system measures the thickness of brake discs from both sides, enabling the exact determination of the so-called Disc Thickness Variation. This factor is very important because in order to achieve maximum efficiency of the braking system, the disc must have an even thickness. Unevenness, runout or abrasion on the friction surface of the disc cause the brake pads to lose contact with the rotating disc which in turn reduces the braking effect. 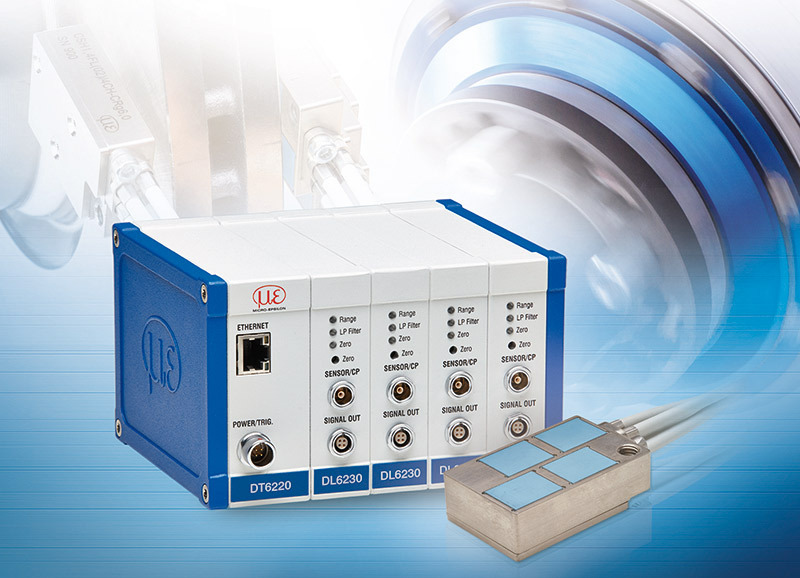 Capacitive displacement sensors enable thickness measurements to be performed on a non-contact basis. While the brake disc rotates, the thickness deviation is determined via the circumference of the entire disc. Using several sensors in pairs also enables multi-track thickness measurements. Due to its robust construction, the innovative capaNCDT DTV four-channel sensor is suitable for harsh ambient conditions in test benches or road tests. In its compact housing, four capacitive sensors detect the measurement values with each operating in standalone mode. A special ceramic substrate protects the sensors from mechanical and thermal loads, providing high temperature stability. In order to enable accurate measurements with simplified mounting, the sensors are available as mirror-inverted arrangements that can be mounted on opposite sides of the brake disc. Combined with the capaNCDT 6220 controller, the four sensor channels can be processed synchronously with dynamic measurements up to 5kHz and digital outputs via Ethernet or EtherCAT or as analog signal. Mobile measurement tasks such as the verification of warranty claims or quality assurance purposes can be performed using the measurement carry case, which provides a complete package. This case is particularly useful for brake disc manufacturers or for the automotive industry and its suppliers. It contains a dual-channel controller, two sensors with cable, a bracket kit and the corresponding software license. The software enables automatic compensation for perforated brake discs, automatic and manual rotation detection via the peak-to-peak evaluation, as well as printing and storing of measured data.